QIANSE, a France registered jewelry brand, is entitled to purchase authentic Swarovski crystals, design jewelry and use Swarovski Elements trademark in the packaging and promotion of Qianse products. Every year, QIANSE designers travel around the world 2-3 times to seek inspirations and conduct quarterly researches and new designs. QIANSE is renowned by its classic and playful designs especially popular among gentlemen. 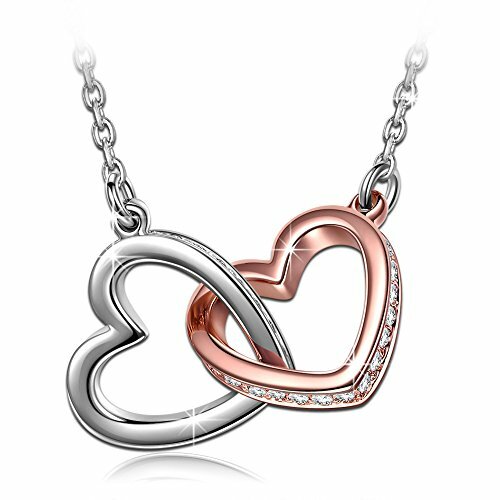 They express loves by choosing meaningful QIANSE jewelry as ideal gifts for daughters, mothers, wives, and friends for Christmas Day, Anniversary Day, Valentines Day and Birthday. Every piece represents a beautiful dream and tells the story of a charming lady! Qianse has its own factory with over 10 years professional experience and lots of jewelry technology patents. Owning a factory, we are able to reduce costs and have a better control of quality. Visit Qianse storefront for more fine Necklaces, Bracelets, Earrings and Jewelry Sets. Search series name to complete the whole set! ♥IDEAL Gifts for Women Girls♥ Comes in a fine gift box. No wrapping needed. Perfect gift for Christmas, Birthday, Anniversary, Valentine's Day, Mother's Day, etc. Great Gifts for Mom, Gifts for Mother in Law, Gifts for Wife, Gifts for Daughter, Gifts for Grandma, Gifts for Granddaughter, etc. ♥Specification♥ Pendant Size: 0.6*0.6 inch per heart, Chain Length: 17.5+2 inches . Eco-friendly White Gold & Rose Gold Plated Zinc alloy, Lead-Free & Nickle-Free, No Harm to Health, Passed Swiss SGS Inspection Standard. ♥After-Sales Service♥ 30-day money-back guarantee for any reason; 12-month warranty for quality-related issues. If there is any problem with your purchase, please feel free to contact us, we will help to fix the problem. Thank you! ♥Attention♥ This is NOT a Swarovski product but a piece made with Swarovski Crystal. Qianse has its aspiring designers in France. We purchased Swarovski Crystals as raw material and skillfully manufactured in our independent workshops. ♥Symbol of Love♥ The Love between you and I is forever. A meaningful gift for someone special. If you have any questions about this product by QIANSE, contact us by completing and submitting the form below. If you are looking for a specif part number, please include it with your message.